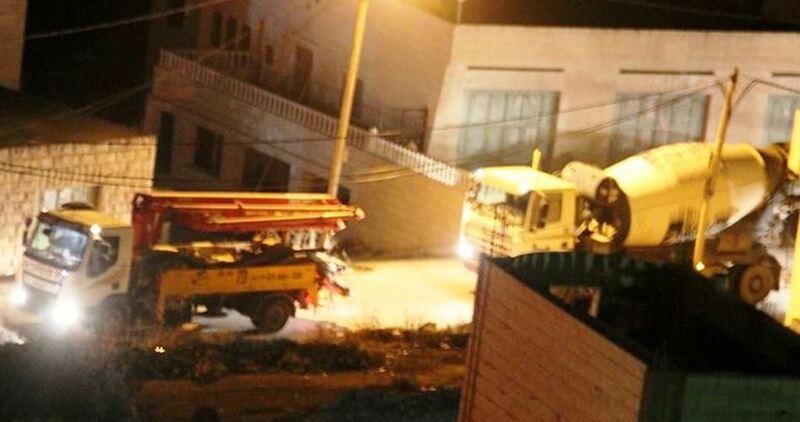 Israeli soldiers, police officers and personnel of the Jerusalem City Council invaded, earlier Tuesday, the town of al-‘Eesawiyya, north of occupied East Jerusalem, and demolished an under-construction Palestinian home. The WAFA Palestinian News Agency has reported that the demolished home is owned by Hasan Yassin Mustafa, and his family. It added that dozens of soldiers and officers surrounded the entire area, before invading it, and demolished the property. The army claimed the home was being built without a permit. Israel rarely grants construction permits to Palestinian families, in various parts of occupied East Jerusalem, and its surrounding areas, an issue that forces many Palestinians to build without permits to house their expanding families. 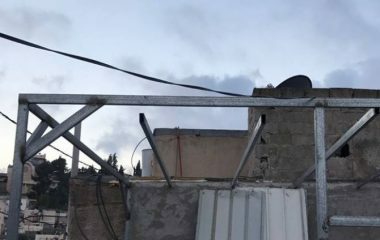 On Sunday, members of Qara’in family in Silwan were forced to demolish their own shed in Silwan, to avoid high fines and fees, after the Jerusalem City Council decided to demolish it. Umm Ammar Qara’in, the owner of the property, said the family had to demolish its own property, especially since the City Council orders families to pay very high fines, if the municipality demolishes their properties. The demolished 16 square/meter property was built nearly two years ago, and was constructed with bricks and fortified iron plates. The Israeli occupation authorities (IOA) renewed an order on Sunday to confiscate Palestinian lands in Beitunia town in Ramallah province for military purposes. According to Quds Press news agency, the mayor of Beitunia, Rebhi Doleh, said that the IOA renewed an order to confiscate dozens of dunums of Palestinian lands in the town. He added that a large area of Beitunia town has been confiscated on stages many years ago for military purposes, pointing out that the confiscation order is renewed every two years. As part of the ongoing Israeli violations against Palestinian citizens, the IOA prevented implementing a sewerage project in the town although it is funded by a German foundation, Doleh added. 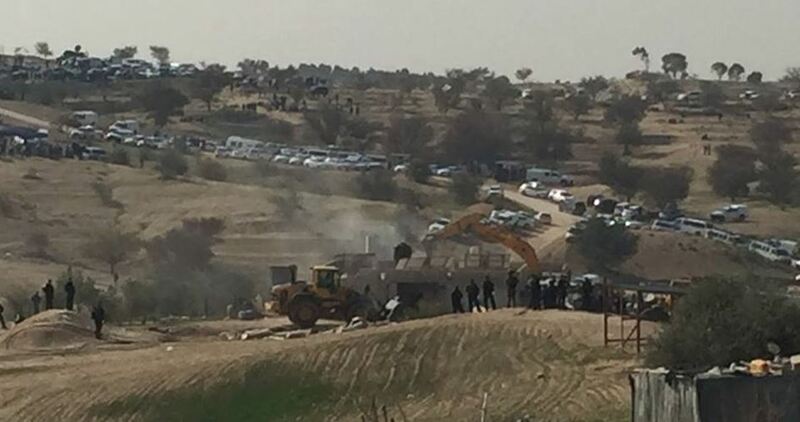 The Israeli occupation authorities (IOA) ordered halting the construction of nearly 16 Palestinian facilities, including houses and sheds, in the northern Jordan Valley on Sunday. Moataz Bsharat, who is in charge of the affairs of Tubas province and the northern Jordan Valley, said that the IOA distributed written notices ordering a halt to the construction of 16 facilities in the region, according to Wafa news agency. Bsharat added that the period of the notifications is due to expire on 26th February 2017, noting that these facilities, which are owned by Abu Kabbash family, shelter 7 families. Ismail Haneyya, Deputy Head of Hamas’s Political Bureau, revealed that the Emir of Qatar Tamim Bin Hamad Al Thani approved a bank guarantee of 30 million dollars for three months to start the implementation of 161 Project in order to overcome the power crisis in the besieged Gaza Strip. 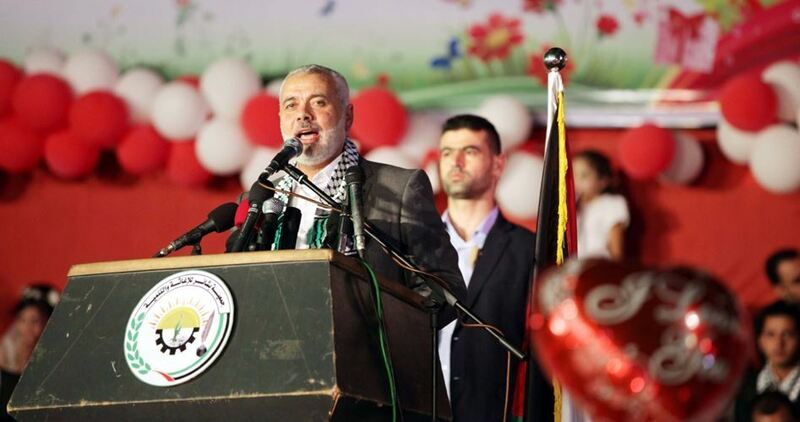 The Hamas leader called for a serious cooperation by the Palestinian Authority (PA) in order to accomplish the project. Within the event of handing over the second stage of Hamad City’s housing apartments, Haneyya said that the Qatari Emir approved to deposit 100 million dollars in Gaza Reconstruction Fund. Qatar has also approved to pay 25 million dollars for the construction of a hospital in Rafah, Haneyya pointed out. High-level coordination between Qatar and Turkey has been taking place for the sake of resolving the energy crisis in the blockaded enclave, he highlighted. 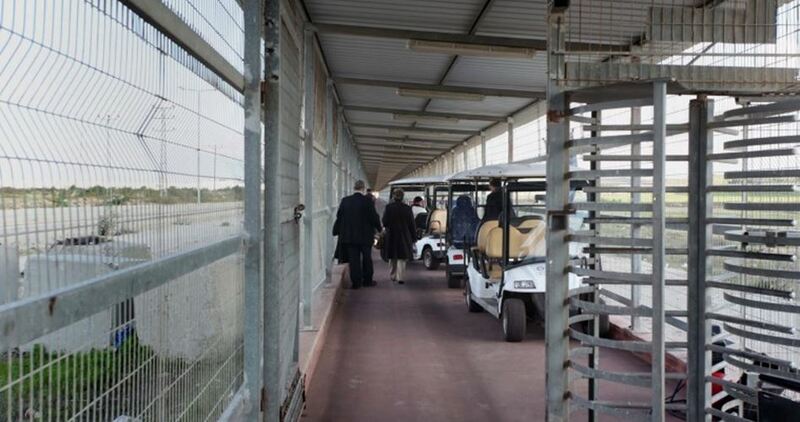 Ambassadors of Norway and Japan to Palestine arrived Wednesday morning in the Gaza Strip via Israeli-controlled Erez crossing to the north of the blockaded enclave. According to the PIC reporter, the Japanese and Norwegian envoys traveled to the besieged Strip with the aim of following-up their countries' funded projects executed by the United Nations Development Program (UNDP). The visit is scheduled to last for one single day, our reporter added. 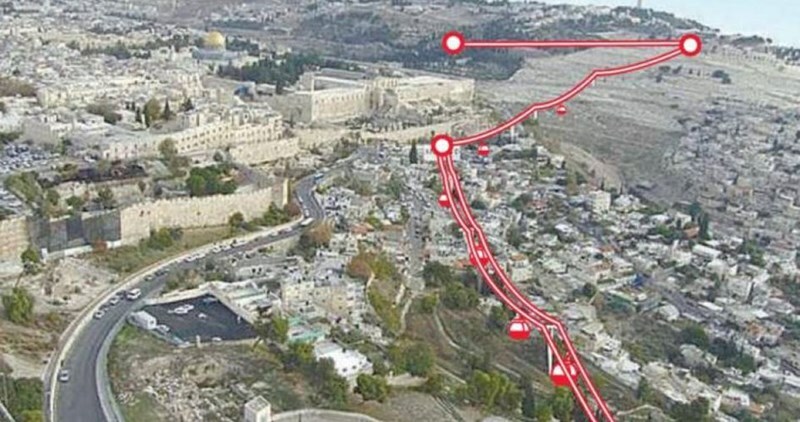 A government-sponsored bill is being currently discussed by a Knesset committee in an attempt to tighten grip on Palestinians building in the Green Line (1948 Occupied Palestine), Haaretz reported Monday. The bill seeks to amend planning and construction laws in order to deter the Palestinians from building homes in the Green Line, an activity deemed illegal by the Israeli authorities. The bill includes increasing the maximum imprisonment for unlicensed building from two years to three years, and reducing the authority of the court in favor of the Finance Ministry’s enforcement unit. Those who violate the bill will also be subjected to demolition and displacement. According to Haaretz, the measure targets Palestinian residents of the Green Line, who have often tried every possible effort to obtain construction licenses from the Israeli authorities. Most of their appeals have, however, gone unheeded. Recently, the Israeli government refused a draft legislation proposed by two Arab MKs in the Knesset to suspend arbitrary demolition of unlicensed Palestinian homes for four years until a solution is found. In January 2017, 11 Palestinian homes were knocked down by the Israeli forces in Qalansuwa town, to the north of the Green Line, and 15 other homes were demolished in Umm al-Hiran Bedouin village in southern Negev under the pretext of unlicensed construction. According to experts, Palestinian residents of the Green Line are in urgent need of 130,000 homes to house homeless civilians, particularly newly-wed couples. Israeli authorities declared intention to tighten penalties against Palestinian owners of “unauthorized” homes, Haaretz Hebrew newspaper reported on Monday. 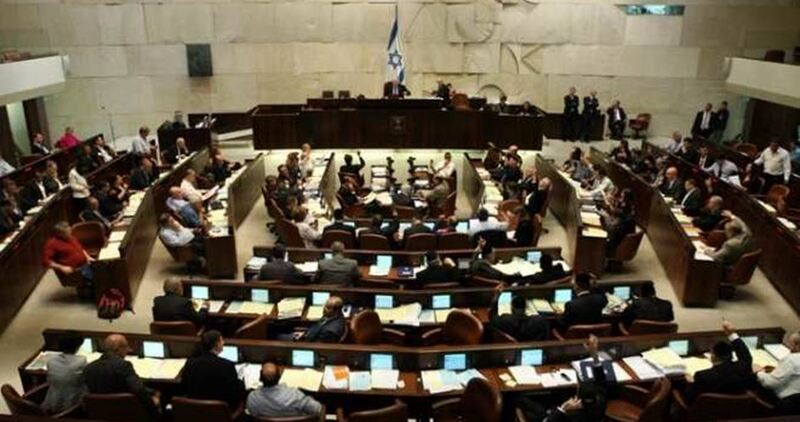 The paper said that the Interior Committee of the Knesset is scheduled to discuss Monday a new bill to regulate planning and building law. The bill aims at tightening penalties against Palestinian owners of “unauthorized” homes, according to the sources. The penalties include imposing 2 to 3 years prison sentences and heavy fines. While refusing to grant Palestinians building permits, the Israeli authorities have recently intensified their demolition operations targeting Palestinian homes, justifying their actions by claiming that these homes were built without permits. The Israeli military in practice refuses to grant building permits to Palestinians in 99 percent of Area C of the occupied West Bank under flimsy pretexts, while granting settlements jurisdiction in the same area, according to the Israeli rights groups Bimkom and B’Tselem. The Israeli army on Tuesday ordered a Palestinian farmer to stop constructing a rainwater harvesting well and an agricultural structure on his land in al-Khader town, south of Bethlehem in the West Bank. The well and the agricultural structure belong to Abdullah Issa and are located in Wadi Libyar area, according to a local activist. Issa was also handed a notification ordering him to demolish the well and the structure at the pretext of unlicensed construction. 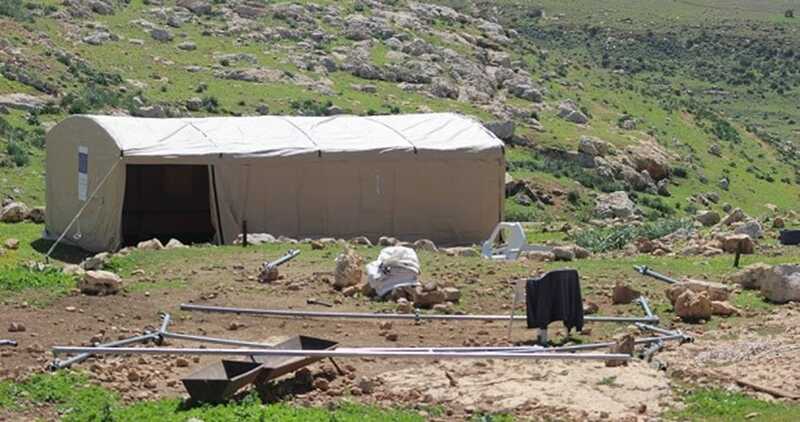 Recently, the Israeli army issued dozens of arbitrary demolition orders against agricultural structures and wells in al-Khader town. 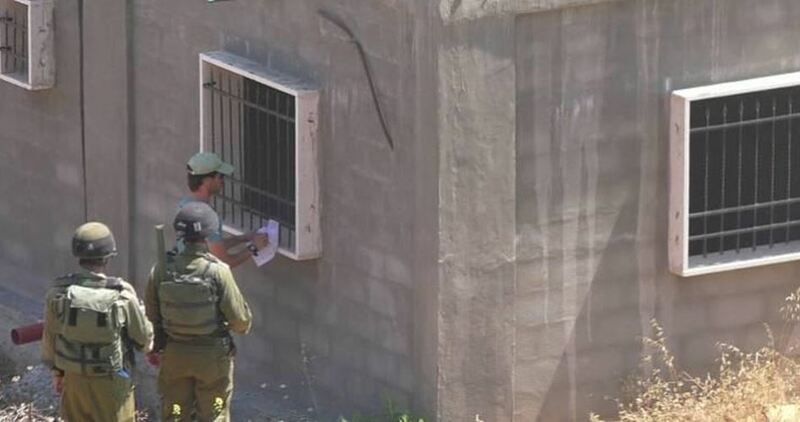 The Israeli occupation authorities (IOA) handed stop-construction orders to 11 Palestinian citizens in Wadi Abu al-Hummus area to the east of Bethlehem city on Sunday. Hasan Brejieh, representative of the Anti-Settlement and Wall Resistance Committee, told al-Quds.Com website an Israeli army unit escorted officials of the so-called the Israeli Civil Administration into the area. The officials handed the Palestinian citizens notices to stop the construction of their houses under the pretext of lacking construction permits. 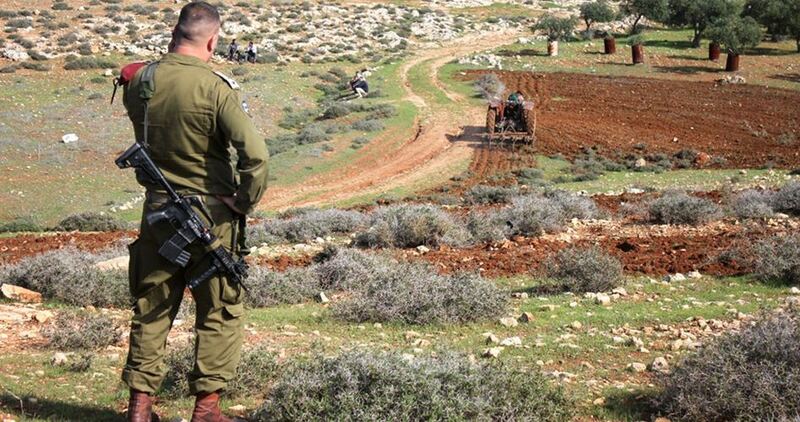 The Israeli occupation forces (IOF) on Thursday hindered the construction of an agricultural road for Palestinian farmers in al-Khalil’s southern village of al-Burj. 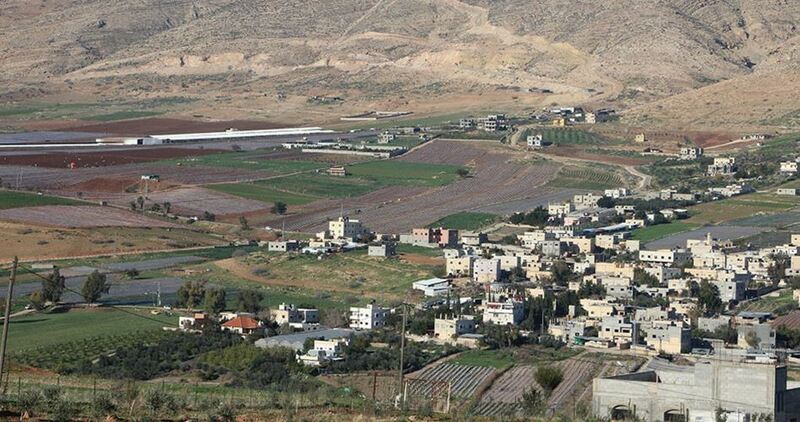 Head of al-Burj village council, Sarhan Amayra, said the occupation army stopped the construction of an agricultural road started by Palestinian farmers to smooth access into their land lots. The stop-construction order was slapped on Palestinian farmers under the pretext of its proximity to the apartheid wall. Amayra added that recently the IOF set up concrete pillars of up to a seven-meter height each along the apartheid wall in an attempt to dismember the village from its Palestinian environs. Amayra underlined that hundreds of dunums of Palestinian lands have been seized by the occupation authorities in favor of the separation wall. He further spoke out against the daily crackdowns, abrupt land confiscations, and movement restrictions slapped by the IOF against Palestinian farmers. An Israeli 770-kilometer-long apartheid wall, 50% of which is still under construction, has severed the ties between Palestinian towns and villages across the occupied West Bank. The Qatari Committee for the Reconstruction of Gaza received Wednesday projects for the development of the southern border area. The Qatari Reconstruction Committee, in coordination with the Palestinian Ministry of Agriculture and the Ministry of Public Works and Housing, is expected to embark on projects for the development of the southern border area in the blockaded Gaza Strip, precisely al-Qarara, Abasan, al-Fakhary, al-Shawka, and Miraj. The project aims to enhance the agricultural infrastructure and smooth farmers’ access to the main thoroughfares. The project also includes plans for new roads, underground and upper ground tanks, along with preplanned endeavors to enhance pumps and the power and solar energy network.